In the winter of 1986, thirteen-year-old Louis vows to kiss the love of his life, the quirky theater queen Carolyn (Hanna Littler) - '…the hottest girl in the eighth grade gifted and talented class' before Christmas. In his way? The forces of puberty, his intolerant older sister (Courtney Brittingham), control-freak mother (Andrea Strom), eternally amused father (Todd Crego), and the unexpected appearance of his grandmothers - Grandma Jacobs (Tom Bennett) and Grandma Skolowski (Morgan Sauls). It’s going to be the worst week of his life. And the best. Told through the eyes of present-day Louis (Adam Dykes), 'Tiny Miracle' is a humorous look at family life in the eighties, filled with laughs and nostalgia, as well as poignant moments and some tears. It also contains some PG-13 content, so parental discretion is advised. 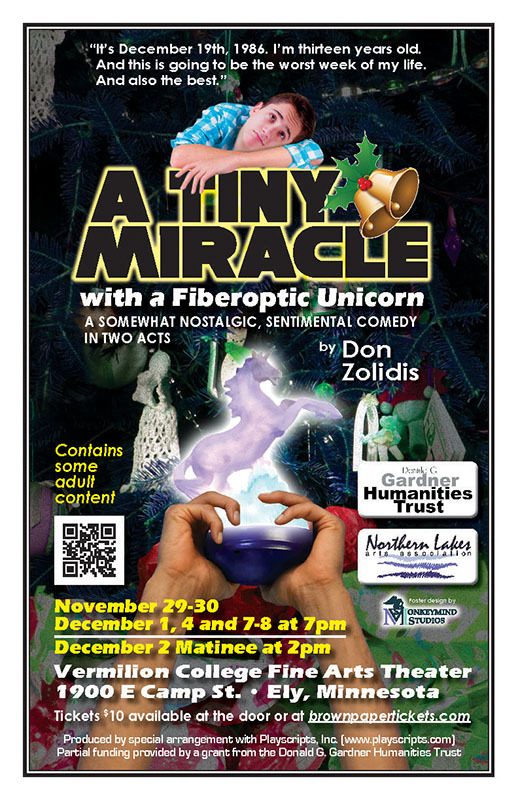 This play is sponsored by the Northern Lakes Arts Association and made possible, in part, by a grant from the Donald G. Gardner Humanities Trust.